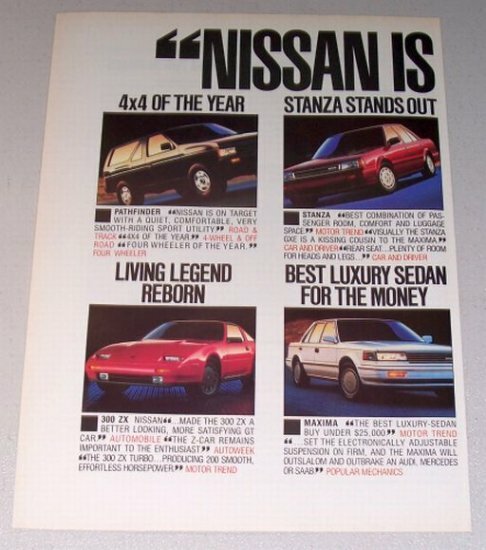 Being offered is an original 1987 NISSAN Automobiles 2 Page Color Magazine Print Ad. Cars in ad include the Nisan Pathfinder, Nissan Stanza, Nissan 300ZX, Nissan Maxima, Nissan Pulsar, Nissan Sentra, Nissan Hardbody Pickup, and the Nissan Passenger Van. Each page measures approximately 8" x 10.75" and is in very good condition.